Congratulations to current and past students from left: Taylor, Rebecca, and Amanda. 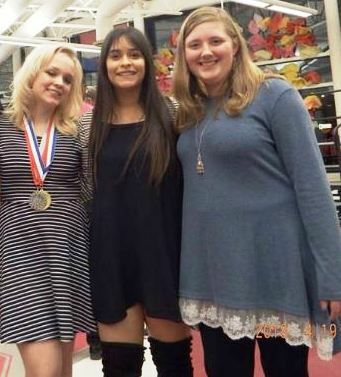 All three of these high school seniors received 1st place awards for their vocal solos in the Illinois High School Solo and Ensemble competition in March. Both Amanda and Rebecca worked with Ms. Laura in January and February on their songs. Rebecca sang “Un Giorno Per Noi” in Italian and Amanda sang “Pokarekare Ana” in Maori. Taylor hasn’t been a part of our musical family in an official capacity for a over a year, but her solo of “On My Own” is one she worked on with Ms. Laura. We are so proud of them. All three are also graduating from TF South High School this month as well. We wish them all the best in their very bright futures.